Remember the infamous line, “If you build it, he will come,” from the Kevin Costner baseball movie? It was true for the movie (famous dead ball players came to play on his “Field of Dreams” in an Iowa cornfield). Unfortunately, building something great doesn’t guarantee customers will come to your business. Building a great business is only the first part. The equally important second part is marketing your business not just efficiently or effectively — but brilliantly. Let us show you how. Almost any business can purchase a CRM (Customer Relationship Management) system, implement it, and usually see a decent return on the investment. Infusionsoft is a particularly powerful CRM system because it can easily handle all aspects of managing business relationships, including email management, automated marketing, sales, e-commerce and relationship management. Most entrepreneurs who take advantage of Infusionsoft’s components enjoy countless hours of saved time and increased revenue. But did you know Infusionsoft can do a lot more? At SmallBusiness.Support, we empower our entrepreneurs by showing them how to use Infusionsoft to market their business brilliantly. We work with you one-on-one, analyzing your business needs, creating a custom implementation guide and assisting you with every step of implementation. However, we don’t shake hands and wish you luck once Infusionsoft is implemented. As an Infusionsoft Certified Partner, we leverage our expertise and ingenuity to design and implement an Infusionsoft system that exactly matches your business needs. We create effective templates and online forms, run email broadcasts, assemble auto-responders series, build campaigns, design landing pages and assemble shopping carts. In addition to the processes directly tied to managing relationships, we dig deeper to help you find innovative ways to easily customize Infusionsoft to simplify internal processes as well. If you need to create new processes or redesign inefficient ones, chances are high that we can help you find a way to do it using Infusionsoft – without having to pay for custom development work. Let us show you how Infusionsoft can grow your business, streamline your workload and save you even more time – spend less time doing “things” and more time DOING THINGS – things that matter. We. Do. Infusionsoft. Let us do Infusionsoft for you. 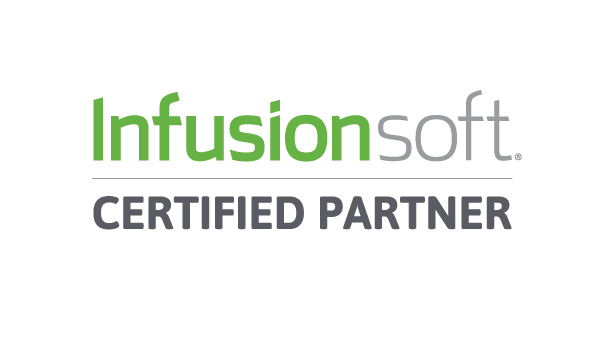 As an Infusionsoft Certified Partner, we leverage our expertise and ingenuity to design and implement an Infusionsoft system that exactly matches your business needs. In addition to building all aspects of relationship management, we help you customize Infusionsoft to simplify internal processes as well.